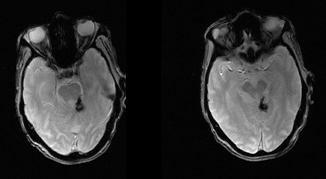 Dr Balaji Anvekar's Neuroradiology Cases: MRI can't replace CT completely. 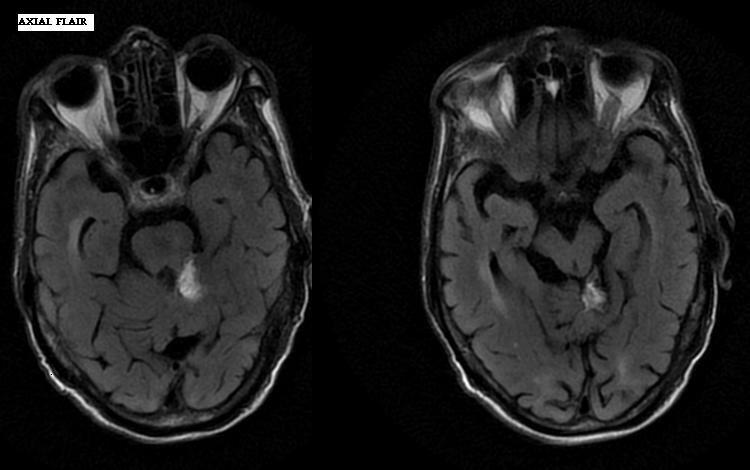 A 72 yo male comes for MRI Brain and Angiography (Stroke protocol) with history of recent onset giddiness. In this case I’m just sharing my experience, what mistake we can do on MRI console when we get influenced by history or the clinical situation. 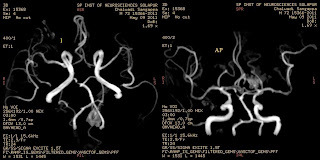 Let's go thro' the MRI brain images and the MR Angiography which is subjected to me as an emergency. In stroke protocol as an emergency we perform limited sequences. Flair 1st followed by Diffusion, T2*GRE and MR Angio of brain neck at the end. Axial FLAIR images show a focal hyperintensity in left half of ambient cistern near tentorium. 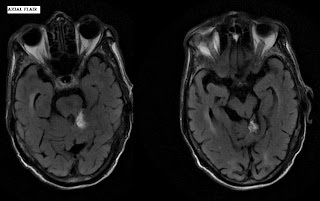 Lesion shows low signals on T2*GRE. 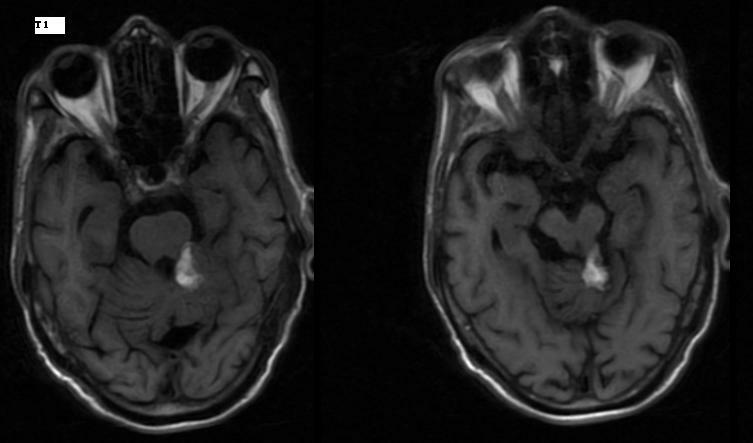 Lesion is very close or along the course of left PCA, picks up flow on non contrast MRI Angio which is subjected to me by my technician. Can u guess what can it be. Ok ill tell what i was thinking - A left PCA cortical branch aneurysm with bleed on GRE. I asked for T1 and T2 images for confirmation. The tissue is bright on T1 and hyperintense to T2. Again hematoma or blood clot in an aneurysm possible as meth Hb a sub acute stage blood degradation product is bright on T1. 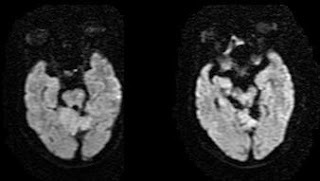 On T2w images there is some distortion of normal pattern of cerebellar folia near cranial portion of cerebellum can be attributed an associated focal Gliosis. So side by side my report was also getting ready mentioning these findings. But somehow i was not very convinced. I requested for CT sections. Just imagine running so many sequences in an emergency may start irritating people around u particularly your technicians. But never mind. It’s a typical fat density tissue, the lipoma giving bright signals on T1, high signals on T2 and FLAIR. Low signal on T2*GRE which is unexpected in lipoma that confused me, but is due to para magnetic effect of nodular calcifications around the lipoma which is known. Distortion of cranial portion of cerebellar folia is an associated malformation of superior cerebellar vermis. Picks up flow related signal when u do add vessel on Angio is artifactual. So please don’t get influenced with history and clinical situation. Really MR can't replace CT completely. Imaging diagnosis : Lipoma at incisura with calcification. Syn : Lipomatous hamartomas, as normally fat not present in CNS. A congenital malformation , not true neoplasm. Contributes < 0.5% of all intracranial tumors. 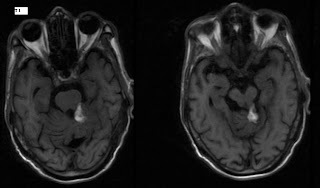 A focal fat density (dark 'z' black) on CT or fat signal intensity (white on T1w image) and is often out standing in the background of adjacent normal grayish brain parenchyma. Noted as an isolated incidental finding or as part of an associated anomalies. Most common anomaly associated is Corpus callosal agenesis or dysgenesis. Most common location is supra tentorium ~80%. 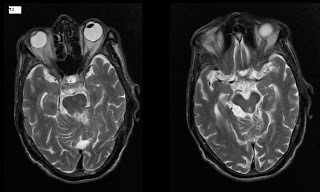 In that most common location is mid line along corpus callosum ~ 50%, Suprasellar cistern attached to infundibulum, hypothalamus ~ 20%, Pineal region ~15%. Meckel's cave and lateral fissures are rare locations. Infra tentorium contributes remaining 20%, in that common locations are Cp angles, jugular foramen and foramen magnum. 1. Curvilinear type is a thin stripe along CC. 2. Tubulonodular type is a bulky nodular mass, frequently show dense nodular calcifications, and often associated with Corpus callosal or adjacent parenchymal anomalies. its very informative blog for each and every medico and non medico...really made a nice job..keep it up. I agree with mister Anonimous. I have scaned, I even reported, pacient waiting for report and The devil of doubt came in. radiology is a ecquation Bright sand dark in a hipertensive is ...but what else. maibe lipoma and calcium. Waiting to rescan the patient I Google after "lipoma .cerebellar..and calcification" and I reach your blog...and stil waiting table to be free for rescaning. Lucky me, patient asked for report in emergency and is still here. I simply saw a plastic specialist in Beverly Hills for what I thought was a sebaceous blister on my temple. In the wake of inspecting it, he let me know that it is really a lipoma.